If you're pining for some retro-styled fun, look no further than Super Flip by Play'N Go. In an overcrowded market, full of innovative new features, it seems many slot developers want to take us back to basics. This slot features classic symbols such as horseshoes and fruit, however that's not to say it isn't also modern and fresh. It's the type of slot that follows in the footsteps of NetEnt's hugely popular Starburst, with bright colours and stylized symbols yet Play'N Go have done a great job of putting their own twist on things. 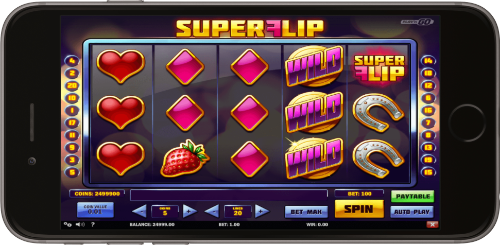 As Super Flip is all about being retro, you're playing on a classic design of a 5x3 reel layout, with 20 paylines. You can start playing this game for as little as 20p a spin, or if you're feeling lucky, the maximum bet is £100. The slot has a low volatility, which means payouts come quick and regularly. However, the main feature that will keep your bank balance in check is how often extra spins or re-spins can be triggered. We'll talk more about this later, but these bonus features do add a lot to your experience and give you a chance at creating a huge win. How huge? 10,000x your wager! True to form, Play'N Go have created a game which gives players excitement and regular action, making boredom a rare event when playing Super Flip. The game is clean, bold but excellently animated. Whilst in screenshots the game could seem dull, it comes to life as you play. It features symbols such as stars, four leaf clovers and card suits – all the things you'd expect to see on a classic one armed bandit. The difference, however, is that Play'N Go have managed to make them feel modern. It is, however, very easy to compare this slot to Starburst or Twin Spin. This is because the graphics are very similar. So similar in fact, we could be fooled into thinking it was a NetEnt slot. In no way is that a bad thing, but if you're looking for a more original game you may want to play something else. In general the slot performs flawlessly. It's quick to load on all devices and the minimalist design means it looks just as great on mobile as it does on desktop. Like it's graphics, the music to the slot is fun and upbeat, and the sound effects help to make the game special. Big wins are celebrated by blasts of yellow light, which add to the sense of occasion. The extra spins in Super Flip are arguably the best thing about the game. They're activated if you collect three or more Super Flip logo symbols anywhere on the reels. You'll be rewarded with 15 extra spins to start with, however they can be re-triggered up to 90 times! During the extra spins rounds the reels are flipped – meaning that reel five becomes reel one etc. This allows you to create some big wins as high value symbols will now appear stacked across the first three reels. In addition, every time you activate the extra spins round, you'll be rewarded with scatter multiplier. This is based on how many scatter symbols were collected in the main game, so three would give you a 2x multiplier, four symbols rewards you with a 40x win and five scatters gives you a 250x multiplier. In an innovative move to capture their players attention, Play'N Go have added a Near Win Respin feature to Super Flip. It's triggered automatically if you come across a stack of the same symbols on reels one and two. As you've the very nearly created a win, reel three will re-spin to give you another chance. It's a feature that's activated quite regularly and can produce some very lucrative results. It's a bonus feature that keeps you on your toes and it's very useful for topping up your balance whilst you're waiting for another extra spins session. Want to play Super Flip? 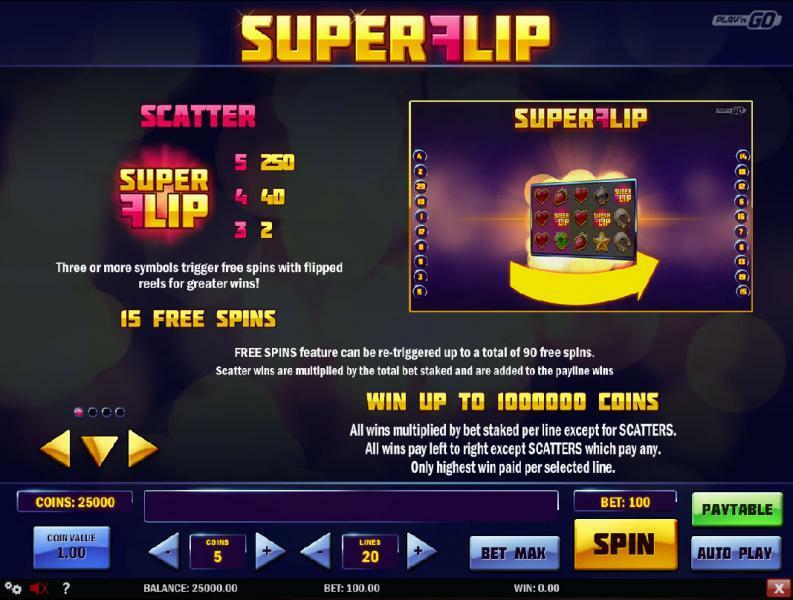 Play Super Flip and enjoy all of the extra spins that are available! Super Flip Overall, we’ve had a blast playing Super Flip. It’s a stylish and fun game that allows you to chase big wins whilst still reaping regular rewards. However, we do think it sounds a bit dull when talked about. The two features of the game, the extra spins and respins, sound average on paper, but once you start playing you’ll be hooked. The slot performs excellently across all devices, and the graphics make it a delight to look at. We honestly couldn’t think of a single problem with this game, however we will say that if you’re looking for innovative design then this isn’t for you. Super Flip is a jazzed up traditional slot, but that’s probably why I’ve enjoyed playing it so much. PreviousAre Online Slot Tournaments Really Worth Your While?